Cushion cut peridot rings are the perfect choice when you're looking for jewelry that is slightly unusual and won't break the bank. The lovely green hues of the peridot complement many different styles of clothing and the unique cushion cut adds a bit of interest to the jewelry. The cushion cut was once quite common and was the cut of choice for diamonds from around 1830 to the beginning of the 20th century, but lost its popularity and came to be known as old-fashioned. It's making a comeback, though, and is being chosen for a variety of stones, including peridot. The cushion cut peridot is a square or rectangular stone with its corners rounded - similar to a sofa cushion. It is sometimes referred to as a pillow cut as well. The cushion cut tends to have larger facets than other cuts. Peridot has been in use for thousands of years and has even been found in ancient Egyptian artifacts. The ancients believed that peridot could bring its wearer good luck, health, protection and success. While the stone has enjoyed periods of popularity throughout history, it had been years since it was a hot item for jewelry lovers. That changed in the 1990s, when a rich deposit of unusually exquisite peridot was discovered in Pakistan. The stones mined from this deposit were of superior quality and stunning color. Moreover, there was an abundant supply of these fine stones coming from this mine and finding their way into the jewelry shops, so that peridot soon regained its popularity. The gemstone peridot is found in varying shades of green. While lime green peridot is most highly prized, the stone can also be yellowish-green, brownish-green and even olive green. It is often used as a substitute for emeralds by those who like the green color but don't wish to pay the higher prices for emeralds. Peridot is ranked at about 6.5 to 7.0 on the Mohs scale of mineral hardness, roughly where glass, quartz and iron pyrite are found. The scale goes up to 10, with diamond ranked 10. Was your sweetheart, Mom, daughter, friend or any other special lady in your life born in August? It so happens that peridot is the birthstone for the month of August. 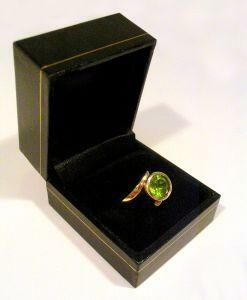 For the next occasion that calls for a gift, why not surprise her with a beautiful cushion cut peridot ring? It's bound to be a unique and treasured addition to her jewelry box. Cushion cut peridot rings are stunning, and with the proper care and attention they will retain their beauty for years to come. A good commercial jewelry cleaner should be sufficient to keep the ring clean. Do not use ultrasonic cleaners or steam cleaners, however, which can damage the peridot. Also, keep in mind that high heat can damage peridot gemstones and keep the ring away from heat sources. My Jewelry Source - This site has many different peridot rings, a few with the cushion cut. Alaska Jewelry - A couple of attractive cushion cut peridots are available here. Evine - This site's cushion cut peridots are paired with diamonds - wow!